'SiamSato' - what is this stuff? Thread: 'SiamSato' - what is this stuff? I always see this stuff on the bottom shelf of the fridge next to the beer. What is it? - Is it alcohlic and is it drinkable? It costs 25B for a big bottle. Try it and let us know why doncha? I warn ya.. no.. not even think about it.. no..
Like to try something a little unusual? Satoh is here. Although Thais have drunk this rice wine for thousands of years, it is only now appearing on mainstream shop shelves in Bangkok. It’s a little like wine and a little like cider. FARANG took on the challenge to bring this intelligent, helpful and impartial review to you, the discerning drunk. Siam Sato: 8% alcohol, sweet, strong smelling and with a strong aftertaste. A little sharp, and could be described as sickly or sticky. Ruan Rak (Sweet Home): 7% alcohol, a drier sato with a slightly sweet aftertaste. A more subtle sato. Gru Pli (Long-Horned Bull): 4% alcohol, a pungent nose, reminiscent of overripe fruit. Made from black sticky rice. Nice flavor, becoming more mellow with each sip. The most expensive of the three at Bt28. So there you have it. Siam Sato is probably best drunk with a mixer (soda?) or at least with ice. Ruan Rak is drinkable and will get you drunk, but look out in the morning. Gru Pli is pleasant but if you’re looking for cheap intoxication, you may have to invest in multiple bottles. I used to drink it often. A slightly gay sort of taste a la babycham, but totally drinkable. Not very strong either, so you might prefer to go for a bottle of Lao Kaao. Sounds pretty cheap but I think Dougal must be right about the hangover. I think I'll just stick with the Heinekin and Scotch. Hmm... I don't even have to edit this one. I just reposted something I found on the internet - I'd never heard of it before. Nothing wrong with drinking it together - whisky is just distilled beer without the hops after all. decent irish whiskey - i.e. Powers, Bushmills or Jamesons (at a pinch!) - straight - do not dliute this good stuff fellows! Drop the shot glass into the underfull pint of beer. Grab pint. Drink till the shot glass hits your teeth. Beer with ice - just about acceptable. Getting back to the original topic.... Last night I saw a lady at the local drink shop refilling a Motorcycle Taxi driver's Red Bull bottle with some of that Rice Wine stuff! I just bought 4 bottles of Archer ... but somehow one of them had changed into a bottle of Siam Sato. I didn't even realise I'd grabbed a wrong bottle (Some slack bugger put it with the Archers). Got home, cracked the second bottle ... WTF? That tastes funny! Turn the bottle around and look at the label. "Siam Sato" WTF!? Hit Google up and and find this ancient thread. So now I know. 8% alc ... Weak Rice Plonk. Sorted. But it tastes pretty good. Might buy some for the GF's friends next time they invade the house. I had some, a bottle, today. 8% proof and is quite palatable IMO. I think it may be better if a fruit juice is added. In it's bottled state I'd drink it again without doubt. 20 Baht a 630ml bottle. i accidentally bought it when i first came to Thailand thinking it was a beer. rank and far too sweet for me to finish. 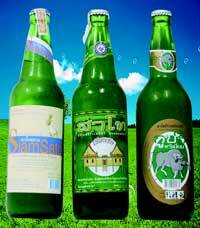 now my body has had a few years of Thai beer it might be better but I just can't bring myself to try it. Got home, cracked the second bottle ... WTF? That tastes funny! Oh come on, FFS, there's far call worse than Archers !! !